If you’re a would-be MBA, you’ll probably know all about the field of financial technology—otherwise known as ‘fintech.’ The intersection of finance and technology, the fintech field has been among the most explosively popular of the past few years. Everyone from banks to money managers and all firms in-between are scrambling to make sense of fintech; how it will impact or disrupt their business model. That means demand for both talent and education is extremely high. MBAs in fintech provide both, and many have dedicated fintech courses written into the syllabus. We’ve charted the top 10 MBAs for Fintech Careers below. You can also read about how fintech is making its way into MBA programs on FIND MBA. Practical experiences are at the heart of Cornell’s MBA ‘Fintech Intensive’ course that is designed to prepare students for careers in finance, tech companies or entrepreneurship. They cover content such as bitcoin or blockchain, and receive guest lectures from top speakers. They then develop a business model and go on a group field project, helping mock clients with a real business challenge or opportunity. The course finishes with a business plan pitch competition, with MBA students presenting their fintech venture ideas to a panel of esteemed venture capitalists. 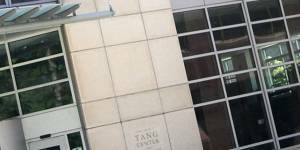 NYU Stern, a stone’s throw from Wall Street, is known for sending many MBA graduates to the finance center, but plenty of them are now trying to disrupt it. Such was demand for financial technology, that Stern introduced in 2016 an entire MBA specialization in fintech, the first of its kind at the time. Courses focus on digital currencies, robo-advisors, entrepreneurial finance and much, much more. The school was also the first to offer a bitcoin course, back in 2014. MIT has always been at the forefront of innovation, so it’s no surprise that the school is at the forefront of fintech education. The Sloan School of Management launched an MBA “FinTech Ventures” course back in 2015, along with other MIT departments. Throughout seven weeks, students explore consumer finance, payments, trading and cryptocurrencies. They then develop business plans for their own fintech ideas in teams that can compete in a school pitch competition. In 2017, California’s Stanford GSB launched an MBA elective on innovating for financial inclusion. Through a collaboration with the Center for Financial Services Innovation, teams of students go into communities near Silicon Valley that do not have access to traditional financial services, and find tech solutions to improve access, such as Oportun, which helps those with no credit history get loans. Duke Fuqua’s cryptocurrencies course was among the first, setup in 2014. Taught by the pioneering finance professor Cam Harvey, it covers one of the most popular areas of fintech, not just bitcoin, the original and most popular digital coin, but also how cryptos could impact the supply chain, accounting, marketing and many other functions. It is taught by top speakers from industry, including JPMorgan and McKinsey, and also focuses on building crypto startups. Some of the world’s most famous fintech companies have come out of business school. 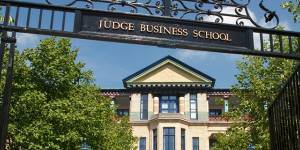 So it makes sense that the Entrepreneurship Centre at Cambridge Judge Business School in the UK offers students a specialist pathway on fintech entrepreneurship. It’s led by Catherine Wines, the co-founder of WorldRemit, an online money transfer company. The idea is to give students the specialist knowledge, and tools to develop a disruptive financial innovation. Columbia Business School (CBS) offers students 22 fintech courses as part of its MBA program, including those focused on data analytics and coding, “quant” finance, and on blockchain, digital tokens and cryptocurrencies. CBS, in New York City, has a student-run fintech club that draws students from Columbia’s engineering and data science departments, too. The Haas School of Business at UC Berkeley, by Silicon Valley, runs, as part of its MBA, a fintech class that provides a deep overview of the industry, everything from payments to artificial intelligence and lending. It also focuses on fintech entrepreneurship. Outside the classroom, Haas has a thriving fintech club and has organized treks to meet fintech companies in the Valley. In Southern California, the Marshall School of Business launched a course focused on how fintech is disrupting traditional finance, and it filled up overnight. It draws top guest speakers, for example from PayPal, to talk about how fintech works in practise, not just theory. Being located in Los Angeles, an up-and-coming fintech hub, helps with this, as well as networking and career opportunities for MBA students interested in the fintech space. London’s Imperial College Business School runs a finance elective in its MBA program that includes a fintech module focused on how new technologies are disrupting traditional banking markets. Imperial College is a world-renowned STEM university, and has established a Center for Global Finance and Technology that connects practitioners, academics and regulators, and produces research on blockchain, high-frequency trading and other areas critical to modern finance.